in a sentence or two: LaVaughn has wanted to go to college since 5th grade, and despite the odds of being in a crappy apartment building, part of a school where shootings aren't rare, losing her two best friends to Jesus, and to top it all off - boy drama, she fights for her hopes of college to happen. LaVaughn is 15, and opens the self narrated novel by talking about the importance of why and how to avoid boys. Her options are less than desirable to her, and so she creates her own - basically playing it smart and focusing on her path to college. It's interesting that she strives for college both for her education and as her means of escape from the situation she lives in. Rightly so, the majority of her narration focuses on school, boys, and friends - the centripetal forces of any teenage girl's life...with a little mom tossed in for good measure. LaVaughn indulges the reader with her insights on her situations, and the way she expands on her thoughts draws the reader closer to her and makes it less of a narration and more of a journey. The characters in LaVaughn's life are amazing and unique. However, they cleverly designed by the author so the reader may find themselves connecting them with people in our own life. While there is a twist with the love triangle that develops early and finishes late, I feel like the novel could be complete without it. 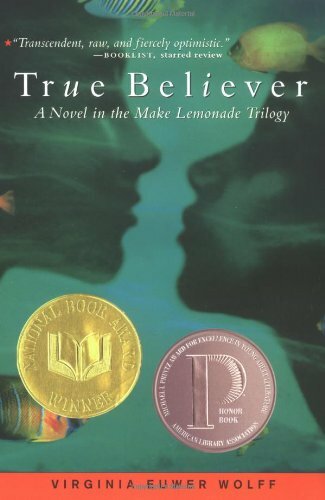 This novel is really about LaVaughn and her life, which is so much more than boy drama (although that is never downplayed from her perspective). I love how the novel is written in verse, and highlights the inner ceiling-painting artist in LaVaughn. The creativity of the execution of the text and the mass amounts of authentic teenage feeling are perfect together. I (as the adult reader) never felt bad for LaVaughn, and I don't think I was meant to. The reader is invited in for this deceptively heavy journey, to feel as LaVaughn does and she (refreshingly) never feels sorry for herself. With the authentic young adult voice and creative prose format, I give this book a 5Q and 4.5P according to VOYA standards.